Halesowen fell at the last hurdle as they fell to a disappointing 3-1 defeat to Scarborough, after conceding two late goals. Halesowen had a chance early on to take the lead as Avun Jephcott had plenty of space in the Boro penalty box and he hit a curling shot that just flew wide of the left hand post. Aaron Griffiths managed to skip past the Scarborough defence and he ran all the way up to goal via the left wing, before hitting a shot that went inches wide of the goal and he was incredibly unlucky to not have a goal to his name. Asa Charlton nearly got himself on the scoresheet as he found space on the edge of the box and hit a shot that went just wide of the right hand post, and by this point Halesowen should have been in the lead. Iyseden Christie managed to break through the Boro’ defence once again as he ran onto a through ball from Avun Jephcott, but he knocked the ball too far and Jason White was easily able to grab the ball from his feet. Christie was gifted another chance in front of goal as he was played onside, and after trying to trick the keeper, two players managed to get back into defence and his shot bounced off one of them and wide of the goal. However, Christie redeemed himself 5 minutes later as, after being taken down in the Boro penalty box, he stood up to take the penalty, and the ball flew past former Mansfield team-mate Jason White and into the bottom right corner of the net to give the Yeltz a well-deserved lead. The second half kicked with Halesowen claiming the first chance of the game as Christie slotted the ball into the box for Ton Tonks to get to and he just managed to beat the defender to the ball, but couldn’t put the chance away. Avun Jephcott was then denied a goal by an unbelievable save by White. Jephcott hit a curling free-kick towards goal and it would have flown into the top right corner if White hadn’t got his fingertips to the ball to knock it away. Scarborough then got themselves an equaliser as Peter Davison was gifted too much space in the Yeltz penalty area and he was able to turn and hit a shot at goal that rolled under Sargeant and into the net. Yeltz collapsed in the final stages of the game as Scarborough scored again. Bryan Hughes’ free-kick bounced towards goal and went into the net as Matt Sargeant failed to gather the ball and after 70 minutes of holding their position, the Yeltz had conceded two goals in three minutes. The Yeltz had completely fallen to pieces as they gave away a penalty two minutes later as Matt Sargeant brought down Ryan Blott in the area. 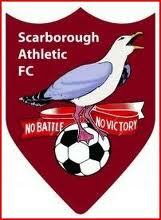 He stood up to take it and he easily slotted the ball into the net to seal three points for Scarborough. HALESOWEN: Matt Sargeant, Kristian Green, Brendan Kelly, Asa Charlton (Shane Grainger), Joseph Hull, Curtis Tilt, Elliott Turner, Thomas Tonks, Iyseden Christie, Avun Jephcott (Danny Waldron), Aaron Griffiths. Unused Subs: Sam Pearson, Neil Mackenzie, Jean-Michel Gueyes. SCARBOROUGH: Jason White, Matty Plumber, Joe Lamplough, Andy Milne, Paul Foot, Peter Davison, Tom Davie, Bryan Hughes, Ryan Blott (Darren Clough), Gary Bradshaw (Ben Middleton), Ryan Williams.. Unused subs: Michael Atkinson, Chris Bolder, Liam Shepherd. Posted on November 24, 2013, in UTL Archive and tagged Halesowen Town, Northern Premier League, Scarborough Athletic. Bookmark the permalink. Leave a comment.